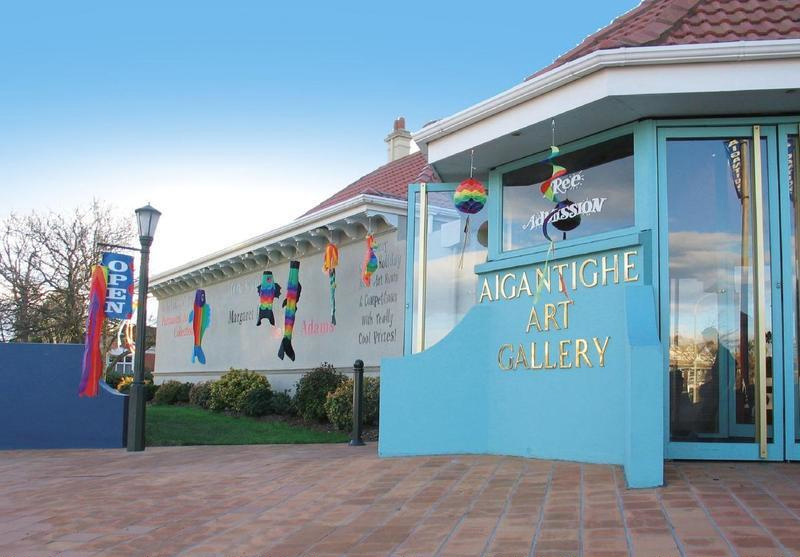 The Aigantighe Art Gallery in Timaru is renowned internationally for its art collection and innovative exhibition and education programmes. It was founded in 1956 by the Grant family who came from Scotland and it now holds the South Island’s third-largest public art museum collection. In 1978 a large modern wing was added giving extensive exhibition space. The Aigantighe prides itself on being a friendly and thought-provoking art museum for everyone. Regional, national and international contemporary and historic exhibitions are held. Aigantighe is Scottish Gaelic for ‘at home’ and is pronounced ‘egg and tie’. Aigantighe holds New Zealand, Pacific, Asian and European art works from the sixteenth century to the present day. Its British Victorian painting collection is of great significance. Masterpieces by Goldie, Hodgkins and McCahon (born in Timaru) feature in a room dedicated especially to them and six new thematic exhibitions from the permanent collection are held in the House Gallery each year. The Aigantighe is well-known for its extensive and innovative use and unique interpretation of its collection in entertaining, well-researched exhibitions. Sixteen new widely-sourced exhibitions are shown each year in the modern wing. Site-specific contemporary installations have been curated such as 129 Oaks which told the story of the famous Lovelock Oak in Timaru. Collaborations with overseas collectors have seen exciting exhibitions such as Swiss-Italian Impressionism (2004), Fashion in the Style of Frida Kahlo (2006), Generations (Dutch art 2007) and Native American Art (2007). As the public art museum of South Canterbury Aigantighe puts a particular focus on professional, emergent and ‘outsider’ regional artists. Exhibitions by other New Zealand artists are sourced by networking with artists, museums, dealer galleries and private collectors. The Aigantighe actively supports life-long learning and has energetically launched a number of New Zealand art museum education programme ‘firsts’. Historic painting dress-ups are replica children’s costumes of those depicted in Victorian paintings in the Aigantighe’s collection. For visually impaired and blind visitors special touch sculptures and “tactiles” which have a raised relief replicate paintings in the Aigantighe’s collection and labels in Braille are in development. Each year two special events focus on younger artists: Artarama! The Festival of South Canterbury Student Art and Polychrome, the Aoraki Polytechnic exhibition. School holiday programmes are hugely popular and keep families occupied for hours. Aigantighe ‘firsts’ include Art Hunt booklets which really get children looking at artworks and Chen Tse-Lung the 600 year old Chinese warrior sculpture who comes alive! Also on are Art competitions, Colour Costumes with treats for all and great prizes. Colour Puppets take over the Aigantighe in the holidays and invite children to see the art works through their “fantasy museum” eyes. Nga Kahui o te Maunga Kei Kei: The Sculpture Garden. The Mt Somers stone sculptures in Aigantighe’s garden are by New Zealand, Japanese and African artists. The sculpture garden is always open. Tue-Fri 10.00am-4.00pm Sat-Sun 12.00pm­ -4.00pm The sculpture garden is always open.